You don’t need to heat up the kitchen to make your favorite stuffed peppers. 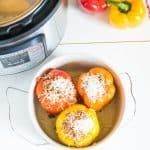 These Instant Pot Sausage and Rice Stuffed Peppers are the perfect easy to make comfort food, good any night of the week! And, you won’t make a sink full of dishes preparing them! Turn the Instant Pot on to sauté and brown the Italian sausage with the onion. Add in the tomatoes and continue to sauté for 2 minutes. Wash and cut top off of the bell peppers. Scoop out seeds. Mix together rice, sausage mixture, half the cheese and seasonings. Stuff peppers with rice/sausage filling. Place peppers in an oven-safe casserole dish that fits into the Instant Pot. Depending on the size of your peppers and casserole dish, you can either add a couple peppers in a top layer or cook 3 at a time. Put dish/pan on top of trivet and lower into the inner pot of the Instant Pot. Turn pressure valve to sealing and set manual pressure on high for 5 minutes.